What is the proper way to have afternoon tea? What do I wear? Do I eat everything with my fingers? Have questions about afternoon tea? Great! I have all the answers. Afternoon tea is a mid-day light meal made up of dainty savories, scones with clotted cream and jam, and sweets. The idea started in the 1840s in England by Anna, the seventh Duchess of Bedford. In the late afternoon, around 4PM, the Duchess would get hungry but she didn’t want a full meal since dinner was just four hours away at 8PM. She started with a small snack with tea but eventually it developed to how we know it today with small bites of tea sandwiches, scones with clotted cream and jam, and sweets. The concept of afternoon tea grew once she started inviting friends over and it became a social gathering for women in the wealthy social class. Today, afternoon tea has evolved into a set meal consisting three courses of savories, scones, and sweets to be enjoyed by all as an occasional luxury. Traditional afternoon tea is usually served between lunch and dinner, between 3PM and 5PM. Is Afternoon Tea the Same Thing as High Tea? Afternoon tea is a light meal composed of tea, finger sandwiches and savories, scones, and sweet pastries served between 3PM and 5PM. High Tea is a working class family evening meal or dinner, made up of hearty dishes and it was served between 5PM and 7PM. Afternoon tea is also known as ‘low tea’ since tea is served on low tables with comfortable chairs. High Tea, on the other hand, is eaten at a high table (dining room table). When people call afternoon tea, ‘high tea’ since they think it sounds fancy, they are simply incorrect. Is there a Proper Order to Eat Afternoon Tea? Yes! 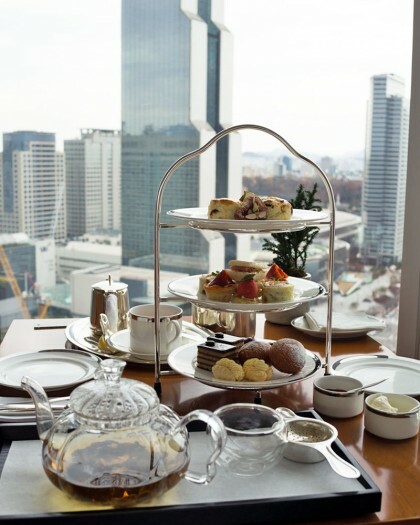 Traditional afternoon tea is served in three courses usually on a tiered stand. You should eat the savories first, the scones second, and the sweets last. What’s the Proper Way to Eat a Scone? Start with scooping some clotted cream and preserves onto your plate using the small utensils provided. 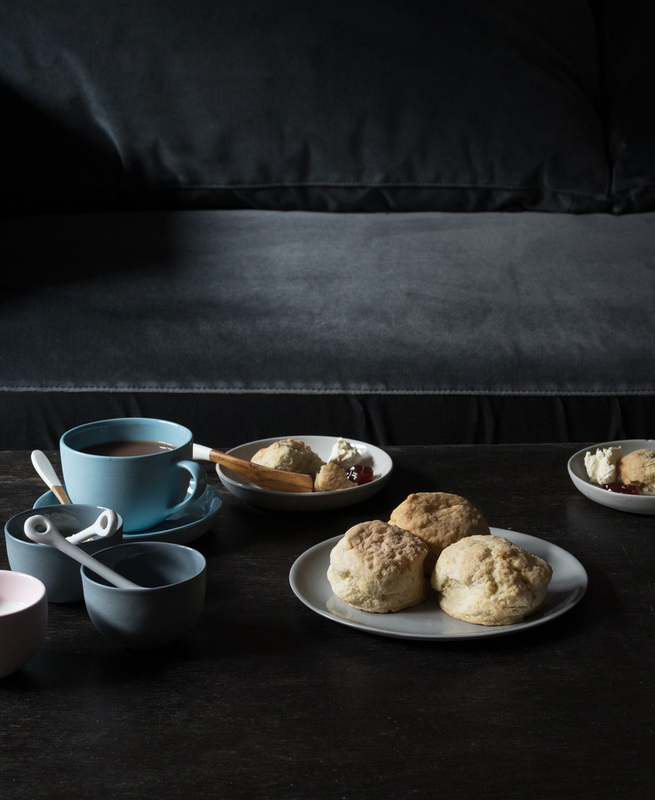 Next, break off bite-sized pieces of the scone using your hands and use your knife to spread the clotted cream and preserves onto the broken piece of scone. Eat that piece of scone, then repeat. Do I Eat Everything with My Hands? Yes! The tea sandwiches, the scones, the sweets, are all to be eaten with your hands. 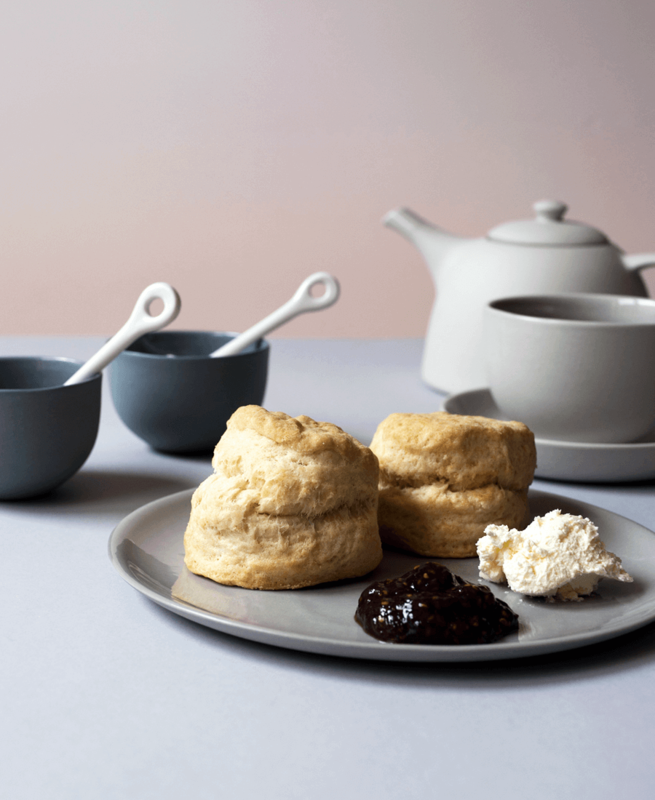 Utensils only come into play when spreading clotted cream and preserves onto your scones. You may need a fork if your dessert is too messy and require a little assistance. Should I Raise My Pinky Finger When Drinking Tea? The proper way to hold a teacup is to use your thumb and index finger to hold onto the handle. The third finger rests on the handle and the pinky is not to be raised or sticking out — it’s considered rude, unsophisticated, and definitely not proper. Where Should I Put My Utensils? Never place a utensil directly back on the table after it has been used. After a knife or fork has been used, place it on a dish. Same goes for your napkin, once it has placed on your lap, never put the napkin back on the table. Instead, put it on your seat if you need to leave the table. Where Should I Put My Teaspoon? After using your teaspoon, place it on the saucer, behind the teacup. Don’t drink the tea with the spoon still in the cup. Can I Add Milk to My Tea? If you’re ordering black tea, yes, feel free to add sugar or milk. However, don’t add sugar or milk to white tea or green tea. They’re meant to be had without anything else added. Do I Drink from the Teacup with the Saucer? The proper etiquette is to keep the teacup and saucer no more than 12 inches away from each other. If you’re sitting up at the table, you shouldn’t need to raise the saucer with the teacup. However, if you’re finished with the food and are leaning back away from the table, pick up the saucer but keep it at waist level while you sip from the teacup. How Do I Ask for More Tea? With good quality loose leaf tea, you can get multiple infusions or steeps. Instead of asking for more tea, ask for more hot water to steep the tea a second or third time. Cream Tea is a shortened version of afternoon tea with just the scones course with clotted cream and jam. No savories or sweets are served. Royal tea is afternoon tea with champagne. Afternoon Tea usually lasts about 2 hours. Afternoon tea is a relaxing experience but it’s somewhat formal so you don’t want to look like a mess. It’s best not to wear sneakers or jeans — business casual at the minimum. It’s a great reason to get dressed up. Is it OK to Bring Home Leftovers? Unless you’re asking them to pack up your one half-eaten finger sandwich, don’t be shy about taking home the leftovers from your afternoon tea. Yes, most places require it. Make reservations at least 24 hours in advance. Some places will turn you away if you don’t have a reservation. How Full Will I be After an Afternoon Tea? I don’t plan big dinners after an afternoon tea since I’m usually full after. How Does Afternoon Tea Work? Afternoon tea is a set menu that comes with tea. In the price you pay per person, you’ll get three courses of food (tea sandwiches, scones, and sweets) and tea. You choose the tea but you don’t choose the food options in the three courses. I’m Vegetarian, What Can I Eat? If you’re vegetarian, let them know when you make the reservation and when you place your order after you’re seated. 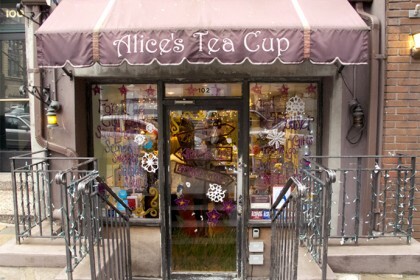 Most places will accommodate and they’ll switch out tea sandwiches with meat with vegetarian options. I’m Having an Afternoon Tea Party. What Savories Should I Serve? Hi. Could you tell me how many pieces of each course in an afternoon tea should I allow per person when catering my Mothers 80th birthday. Thanks. Hi Biddyb, I would do 4 pieces of bite-sized savories, 1 small scone with clotted cream and jam, and 3-4 pieces of small sweets per person. I’m allergic to gluten, what can I eat during high tea? Hi Windy, the best thing to do is to let the place know you don’t eat gluten in hopes that they can adjust the food for you.